Carol Ma could never imagine that she would own her second car, a BMW 525i, so soon. "Just after the salesman introduced BMW's auto financing service to me, I made up my mind straight away at the 4S store, attracted by the easy acquisition process of the car, convenient financing procedure and favorable interest rate," said Ma, a 31-year-old Beijing lawyer. German luxury carmaker BMW was the first among 10 auto-financing companies to initiate the "zero interest rate" promotion campaign in China in September 2008. After paying just 30 to 40 percent of the total, customers could drive their BMW car away and pay the rest without any interest in the following months. BMW's rival Mercedes-Benz also provides similar financing with zero lending rates to customers who have made a down payment of 30 percent. "Small- and medium-sized enterprise owners like me don't have enough cash flow and even face difficulties in financing. Auto financing provides opportunities for us to buy cars during tough times, especially luxury brands, which are necessary for our business," said He Minghua, owner of a small packaging enterprise in Zhejiang province. Although the auto financing service has been available since a pilot was run by State-owned banks in May 1996, the sector still lacks depth. In October 1998, the People's Bank of China authorized the four largest State-owned banks to undertake auto financing. However, under this plan, individual purchasers had to deposit the full purchase price of a car in a bank while paying off the loan. In August 2004, the first auto financing company, GMAC-SAIC Automotive Finance Co Ltd, established by General Motors Acceptance Corp and Shanghai Automotive Group Finance Corp, began operations in China. The company has provided financial services to more than 225,000 consumers in China for purchasing GM vehicles. This year, Chery Automobile, China's fourth-largest carmaker, invested $72.7 million in an auto financing joint venture in cooperation with local Huishang Bank, the first domestic carmaker to participate in the sector. "From August, Chery's auto financing arm has launched auto financing services for individuals in four major cities, including Beijing. We believe that the auto financing service can boost our domestic sales," said Jin Yibo, Chery's spokesman. "And, we hope the financing arm can contribute half of our total business profit in future." 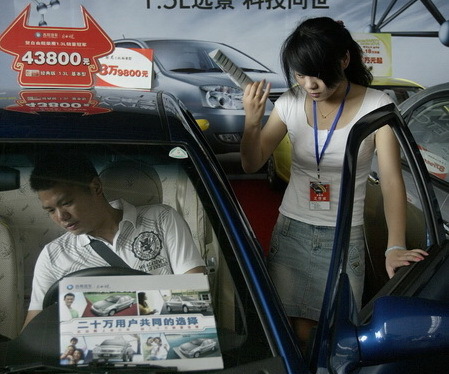 However, after five years, there are only 10 such auto financing companies providing services in the country, and currently, according to Donghai Securities, only 6.6 to 7 percent of the Chinese consumers apply for loans from financial institutions to purchase cars, a figure far lower than the global average. In Western countries, auto financing accounts for 60 to 80 percent of vehicle sales. A Beijing newspaper reported last week that Guangzhou Automobile Industry Group Co has received regulatory approval to set up an auto financing arm, providing financing services to its own brand as well its ventures with Toyota, Honda and Fiat. Seeing the profit potential in the auto financing sector, China's automakers, including FAW Group, Chang'an Automobile Group Co, Brilliance Auto and Jianghuai Auto, are awaiting government approval to set up their own financing arms. On Aug 31, China's banking regulator and the central bank issued rules to allow auto financing and financial leasing companies to raise money by issuing bonds, a move to boost auto sales and develop the auto financing industry. According to the central bank, by the end of July, China's 12 financial leasing companies had total assets of 108.1 billion yuan ($15.8 billion) and the 10 auto financing companies had total assets of 37.8 billion yuan. "The financing channel has been the bottleneck for China's auto financing companies for a long time. Permission for them to issue bonds will spur the development of the segment and accordingly drive sales in the domestic auto industry," said Jia Xinguang, chief analyst with the Chinese National Automotive Industry Consulting and Development Corp.
"The auto financing service can also bring profits to auto companies and the necessary diversification will orient new businesses and realize economies of scale for the automakers," said China Jianyin Investment Securities in a report. "With the support of the government and the development of the market, we predict that after 10 years, the percentage of Chinese buying cars through mortgages will increase to between 40 and 50 percent," said Lang Xuehong, chief auto industry analyst at Sinotrust. "China's auto financing market may touch 550 billion yuan by 2025." However, Jia said the government should ease regulations on auto financing channels to boost the industry's development. "The current rules on bonds issue are still restrictive and limited, and are not applicable to most of the auto financing companies," said Jia. To qualify for issuing bonds, companies will be required to have three consecutive years of profit and profit in the third year must be no less than the industry average. The companies also must have stable earnings prospects and their net assets must be at least the same as the industry average, the banking regulator said.